Acute angle closure crisis is one of the few true emergencies in the glaucoma world. 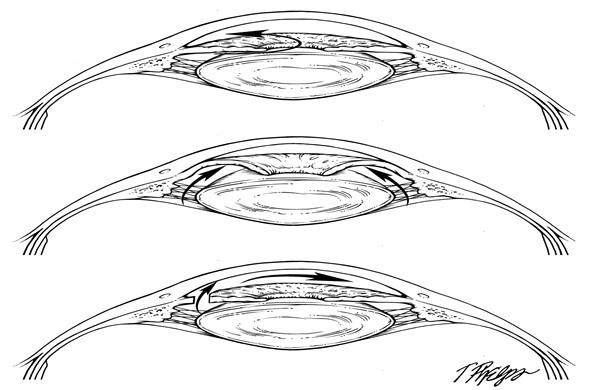 Of all of the forms of glaucoma, angle closure has a much greater chance to cause permanent vision loss than open angle glaucoma, and the acute crisis (frequently called an acute attack) probably accounts for a lot of this damage. It happens to those with angle closure under the situation where aqueous humor movement from behind to in front of the iris is so blocked that the pressure behind the iris pushes it against the meshwork and stops all aqueous outflow. Eye pressure can rise to numbers like 70 millimeters of mercury (compared to the normal 15-20). This is so high that permanent damage to ganglion cells in the optic nerve happens in days to weeks rather than the much longer, slower process of typical glaucoma. It is the sudden increase in pressure that causes the severe symptoms of the attack. A link between the stomach and the eye causes an attack to be not only the worst pain that people ever remember having, but also it causes nausea and vomiting. Sometimes the stomach problem is so prominent that people go to an emergency room and the staff pays attention to that, thinking it is appendicitis, before realizing that the eye is the cause. Acute attacks also get misdiagnosed as migraine headaches. The eye symptoms of acute crisis are pain, poor vision in the involved eye, redness of the white part, and a bigger and irregular pupil shape. More than 90% of acute crises are in one eye only, but for one in 10 persons it happens in both eyes. The things that can set off the crisis are those that can cause the pupil to move to the danger position, half-way dilated. These include stress and excitement, spending time in a dark place (such as a dimly lit restaurant), and being exposed to medications that dilate the pupil a bit. This happens during general anesthesia for surgery, since a drug that dilates the pupil (atropine) is given by anesthesiologists. If you have bad eye pain after surgery under general anesthesia, have an exam by an eye doctor immediately. Acute attacks can also be caused by the many pills that are given that can dilate the pupil while helping you with things like incontinence, sinus troubles, and upper respiratory colds. • To prevent an attack of acute glaucoma. • To treat an attack of acute glaucoma. • To treat chronic glaucoma where the drainage channel is very narrow. This laser procedure is performed to preserve sight. It will not restore or improve the sight. Regular eye-check-ups can prevent such crisis to happen. In the event that someone does experience eye pain with nausea and headache it is prudent to immediately consult your eye doctor.